I spent some t ime the past couple of weeks on a listening tour among several seasoned insurance agents, trying to get a feel for what’s goingon in the field in flood insurance and other lines of coverage. No one knows that better than the foot soldiers who are on the frontlines every day talking to and taking care of policyholders. Thought our readers would enjoy this young man’s silver lining post-election. It gives us perspective as we stay glued to Florida’s primary election returns tomorrow evening. Up next is this edition of our newsletter packed with relevant and timely articles! 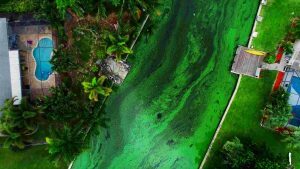 The smelly eyesore of algae blooms continues to grow on both Florida coasts, even as progress is being made in eliminating large mats of algae floating on waterways. While new money is now available for impacted communities – where tourism business is off by as much as 40% – a third type of algae has since been discovered. The third type of algae, created by decomposing fish, has been found in southwest Florida waters around Fort Myers. According to the News-Press of Fort Myersscientists say it appears to be blooming between the red-tide algae coming in from the Gulf of Mexico and the blue-green algae blooms in the Caloosahatchee River coming from nutrient-rich water discharged from inland Lake Okeechobee. The red-tide is blamed for killing more than 100 tons of fish and other sea life that have been shoveled up from nearly deserted beaches along the southwest Florida coast this month. In one recent week, 12 dolphins washed ashore dead in Sarasota County, a typically toll for an entire year. Both algae are naturally-occurring and have been around for centuries. What’s different this year is the size and persistence of the blooms and that they are occurring simultaneously. Red-tide, from the Gulf of Mexico, dates back to the 1800’s and is usually only a winter season phenomenon. Scientists don’t know why it exists and acknowledge it could be an important part of the natural ecosystem. An $8 million federal grant is being distributed by NOAA to South Florida researchers to study it. Aecom, under contract by Lee County through state grants, has been scooping up the blue-green algae around Fort Myers for the past two weeks. “We’ve worked at several marinas, including the Cape Coral Yacht Club and some residential canals and it’s been very effective,” according to Aecom vice president for environmental services, Robert Cooper. Specially designed floats skim the water and collect the algae, which is then sucked through flexible tubes into a holding tank aboard a boat. Once it’s treated with chlorine, the solids go to a landfill and the liquid is processed until it’s clean enough to drink, then injected into a deep well. Aecom is beginning work this week on the east coast to do the same thing on the St. Lucie River in Martin County. That river has also suffered from noxious blue-green algae blooms created by the Lake Okeechobee discharges. The Governor has declared states of emergency for both the blue-green and the red-tide algae, which frees additional funds for cleanup and animal rescue, and waivescertain rules and regulations related to government budgeting and procurement. This past Wednesday, DEP committed another $3 million to help local Southwest Florida communities impacted by red tide in coastal Collier, Lee, Sarasota, and Manatee Counties. That’s on top of the $3 million DEP program launched last month to provide grants to counties impacted by blue-green algae, which include many of the above, along with Martin County on the east coast. Foreclosure starts – properties that go into foreclosure for the first time – were up 35% in Florida in July compared to the number in July 2017. One in every 1,180 homes in the Sunshine State had a foreclosure filed last month, the fourth highest rate in the country, behind New Jersey, Delaware, and Maryland. The numbers come from ATTOM Data Solutions, which noted July also saw the first year-over-year increase in foreclosure starts nationwide following 36 consecutive months of year-over-year decreases. Miami was second highest among metro areas posting year-over-year increases in foreclosure starts, up 29%, behind only Houston, which was up 76% and the center of damage from last year’s Hurricane Harvey. Other metro areas posting large increases in foreclosure starts were Los Angeles (up 20%), San Francisco (up 10%), and Philadelphia (up 10%). In other housing news, a larger number of homeowners who find themselves financially stretched have been turning to home-sharing, renting out their homes or individual rooms to short-term guests via such websites as Airbnb. We’ve reported here in the LMA Newsletteron the ongoing fight by some Florida communities trying to restrict the practice, citing zoning violations and failure by homeowners to pay bed-taxes. But apartment complex managers and real estate developers have also been upset at renters found illegally to be subletting their apartments in large complexes via Airbnb. In what seems to be a classic case of “if you can’t beat ‘em, join ‘em,” some of those apartment complexes are now becoming official Airbnb enterprises. Airbnb has partnered with Niido, a real estate development company, to form “Niido Powered by Airbnb.” Their first project was a 324-unit complex in Kissimmee, where apartments can be leased to traditional long-term renters or short-term visitors, with vacant units also rented short-term. Florida’s unemployment rate continues to decline, dropping to 3.7% last month, the lowest it has been since April 2007. But an updated study of Florida’s economy shows that while most indicators are positive, wages remain relatively flat, residential credit is still difficult to access, and residential construction isn’t expected to return to normal for another three years. Florida: An Economic Overviewis a regular report updated by the Florida legislature’s Office of Economic and Demographic Research (EDR). The August update shows that state population growth, employment growth, tourism, and Gross Domestic Product (GDP) continue to grow stronger. For the first quarter of 2018, Florida posted GDP growth of 2.5%, surpassing the national average of 1.8% and ranking the state 11th in the country for real growth. While unemployment has fallen, Florida’s per capita personal income growth continued to trail in performance in 2017, growing only 2.2% compared to the national average of 2.4%. Florida’s average annual wage has typically been below the U.S. average. Preliminary 2017 data shows it has fallen further, to 87.5% of the national average, driven in part by job growth in the low-wage accommodations and food services sector, fueled by increased tourist visits. The EDR report shows the homeownership rate remains below normal, hitting a 34 year-low in 2017 at 64.1%. Single-family building permits are still well below historic norms and “none of the key metrics for residential construction are back to normal until FY 2021-22,” according to the report. While existing home sales volume continues to rise and existing home price gains have roughly tracked national gains over the past three years, “residential credit is still difficult to access.” Diverted homeowners and shifting preferences among millennials have caused residential rental vacancies to tighten strongly in 2015 and 2016; price pressure continues to build. Of course, one of the cheapest places to live in Florida is with your parents. An analysis by the National Association of Home Builders reveals that 27% of 25-34 year-olds in Florida still live with their parents. That’s the fourth highest percentage in the nation, behind Hawaii, New Jersey, and California. Alaska ranked fifth. Higher housing costs and personal debt are the big factors keeping millennials at home, according to economists. In all, the analysis showed about 2.4 million fewer households in the U.S. have been created, because millennials are staying at home with mom and dad. Those tend to be in states with the highest housing costs. Conversely, the states with more affordable housing have the highest rates of young adult household formation. Amendment 13is one of the few single subject amendments on this November’s ballot, but that hasn’t shielded it from being challenged in court in an election year that now has seven of the 13 proposed state constitutional amendments under court review. The amendment would ban live greyhound dog racing in Florida by the end of 2020 and the wagering on such live racing. It declares that “The humane treatment of animals is a fundamental value of the people of the State of Florida.” Earlier this summer, the Florida Greyhound Association filed suit to strike the amendment from the ballot, claiming it was misleading, as it would still allow live greyhound racing from tracks outside the state to be telecast at Florida gambling facilities for wagering. A Leon County Circuit Court judge agreed and struck it from the ballot. The state Supreme Court will hear arguments this Wednesday and have the final say. Amendment 13 was placed on the November ballot by the Constitutional Revision Commission, a group that meets every 20 years to consider changes to the state constitution. You can read more here on how this proposed amendment was created. Of the 13 proposed amendments on this year’s ballot, the Commission created eight – seven of those eight are now under active court challenge. Last week, another Leon County Circuit Court judge removed Amendment 8from the ballot, which bundles three separate education-related proposals into one “yes” or “no” choice. The amendment would establish term limits on local school board members; allow the state to approve and supervise charter schools in place of local school districts; and require civic literacy education in public schools. The court ruled the amendment does not adequately inform voters of its potential impact on the creation of charter schools. The state Supreme Court will hear arguments on this amendment at a future date. The Commission has faced ongoing criticism for its work this past year in “log-rolling” different and disparate measures into single amendments that are supposed to, by law, be single-subject. Last week, former state Supreme Court chief justice Harry Lee Anstead and former Florida Elections Commissioner Robert Barnas petitioned the Supreme Court to strike six of the Commission’s proposals, claiming all are likewise “unconstitutionally bundled.” In addition to Amendment 8, they want struck Amendment 6, which creates new rights for crime victims and new term limits on judges; Amendment 7, which changes University and State College systems’ governance, while providing scholarships to survivors of first responders and military members; Amendment 9, which prohibits both offshore drilling and vaping in indoor workplaces; Amendment 10, which makes a variety of changes to state and local government structure and operations; and Amendment 11, which makes changes to property rights, obsolete sections of the Constitution, and criminal statutes. No hearing date has been set before the Supreme Court. Amendments 6 and 10 are also facing court challenges by others. Meanwhile, a group called “Save My Constitution” announced last week it would publicly campaign against the Commission’s entire slate of eight amendments, calling them “confusing and misleading.” The group has some heavy-hitting former state and federal lawmakers, including former Lt. Governors Jeff Kottkamp and Jennifer Carroll, former Congresswoman Sandy Adams and Congressman Connie Mack, and former state representative Jim Kallinger. The group says it also wants to end the process that they say allows the governor and legislative leaders to name “lobbyists” and “political insiders” to the Constitution Revision Commission. For more information, you can always check out the LMA Backgrounder – Florida’s 13 Proposed Constitutional Amendments on the November 2018 Ballot, also available on our website. 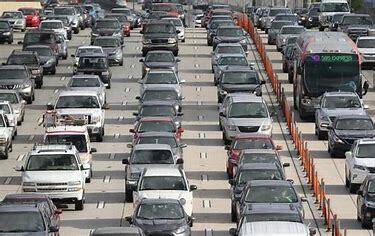 Here’s a number one spot Florida could certainly be without: the worst drivers in the nation. After being number one for the last two years, a new survey shows Florida has now fallen to eighth place in the nation, thanks to a decline in the relative number of traffic deaths and the number of DUIs per driver. We’re still tops though in the rate of uninsured drivers: 27%. Florida lost the number one spot this year to Mississippi, and now trails (in order) Tennessee, California-Missouri-New Mexico-Texas (with a four-way tie), and Alabama. The annual surveycompiled by Smart Asset, a personal-finance company, bases its rankings on four factors: percentage of drivers with insurance, the number of DUIs per driver, the average number of deaths per miles driven, and how often people did web searches about traffic or speeding tickets. The report notes that while Florida still has very high fatality rates, they are improving, with 1.47 fatalities per 100 million miles driven, right behind Alabama. Florida’s fatality rate has fallen by a third since 1994, to nearly 3,200 deaths in 2016. Fatality rates are falling nationwide, according to the National Highway Traffic Safety Administration. In 1994, around 40,700 people were killed in auto accidents, compared to 37,500 in 2016. The big whopper: DUI arrests in Florida have dropped in half, from 4.45 per 1,000 motorists in 2015’s survey to 2.17 arrests per 1,000 in the 2018 survey. One of the biggest drops in DUI in Florida has occurred in the Miami area. The Miami Herald reportsDUI arrests by Miami-Dade County police have fallen 65% between 2015 and 2017 – from 1,500 arrests to 594 last year. Miami city police report their DUI arrests are down 35% in that same time period. Public safety officials and activists are giving partial credit to ride-sharing services, such as Uber and Lyft. Police have certainly stepped up drunk-driving enforcement, but as one officer quoted in the article said, “There’s always an Uber around.” In 2015, Mothers Against Drunk Drivers and Uber reviewed 2015 data and reported that drunk-driving crashes for people under 30 years-old decreased by 6.5% in markets where ride-sharing was launched. Since then, researchers at the University of Pennsylvania found a correlation between ride-sharing and a decline in drunk driving but not in every city. We love our pets and want to take good care of them, without breaking the bank. One area that sometimes gets overlooked, is pet insurance. What was once thought of more as an extravagance has really matured as an insurance line – with very reasonable premiums today. Pet insurance has been around since the early 1980’s and today there are 12 major pet insurance companies operating in North America. According to an article in the Property Insurance Coverage Law Blog, it’s a robust P&C line (as pets are legally considered to be property) with gross written premiums of $1.2 billion last year in the U.S. and Canada combined. That’s a 23% increase from 2016 and covers 2.1 million insured pets – up 17% from 2016. The market is really reaching its stride now. Coverages vary from “Accident Only” to “Accident & Illness” and can include wellness riders and endorsements for catastrophic illness, such as cancer. According to a reportby the North American Pet Health Insurance Association, “Accident Only” policies in 2017 for dogs averaged $190 and $152 for cats. “Accident & Illness” policies averaged about $536 for dogs and $335 for cats. For those of us with pets, we know a trip to the vet can add up fast! Pet insurance usually works as a reimbursement plan, where you pay the premium and the vet bill upfront, and are then reimbursed by the insurance company. There are sometimes limits on the number of visits or incidents per year. For those with multiple pets (I have five dogs) there’s usually one that is the outlier when it comes to multiple visits to the vet! Speaking of dogs, it’s only responsible to think, too, of what happens if your dog bites someone. 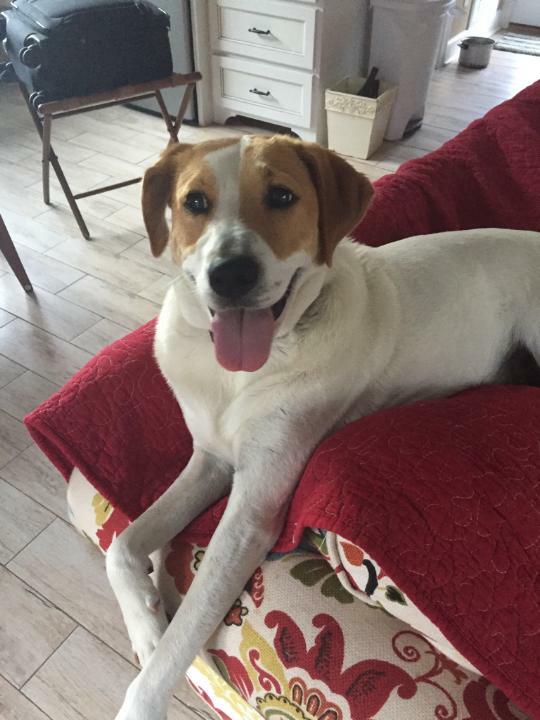 Those of us who work in insurance, know the answer to this one; but this recent article, Man’s Best Friend—Are You Covered?provides the general answer of “yes,” subject usually to the “one-bite rule.” Here’s hoping yours keeps their paws to themselves! We will be thinking of all the candidates who have spent hours and days and weeks canvassing neighborhoods, making phone calls, and asking people for their votes. We live in the greatest country in the world to have the privilege to talk to them. I will be by my phone throughout the night tomorrow evening watching the returns in the Florida primary. I look forward to hearing from you about what’s going on in your precinct in your neck of the woods. Thanks for being a part of democracy and for taking the time to read this edition. Have a great week and see you on the trail.